You may have heard of MRSA infections in people discussed in the media in this last year. Otherwise known as Staph or Methicillin Resistant Staphylococcus aureus, this type of bacteria is resistant to most antibiotics. People infected with this dangerous bacteria can become quite ill or even die if an effective antibiotic cannot be found. 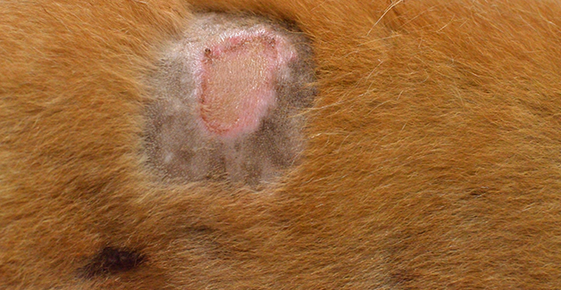 MRSA can also occur in dogs and cats. Staphylococcus aureus tends to occur in people while Staphylococcus intermedius and Staphylococcus schleiferi tend to occur in pets. They are cousins of the same harmful family, but any of the types of Staph can occur in people or pets. Staph infections usually occur in the skin or ears, but many types of bacteria or yeast can infect these areas. Skin infections can appear as pustules (little pus pockets), scales, hot spots (moist, yellow to green discharges in the skin) or broad red areas in the skin. Ear infections usually cause reddened canals, discharge, odor, and you see the pet shaking the head or scratching at the ears. Your veterinarian can determine what kind of infection is present. A test where the doctor takes a sample and looks under the microscope such as a skin or ear cytology is commonly performed. This can help determine if the symptoms are an effect of a yeast infection, bacterial problem, or both. For reoccurring skin infections, or serious infections, a culture should be performed. The only way to determine if an infection is MRSA or a relative is to perform a culture. Your veterinarian will take a sample with a swab and send it to an outside laboratory. Usually three to five days later a report will detail the type of bacteria and, most importantly, list which antibiotics should work. Commonly 15 to 20 antibiotics are tested. Treatment usually consists of an appropriate oral antibiotic for at least three weeks, frequently for four to eight weeks, sometimes longer. Occasionally all the antibiotics that can be given orally are resistant, and injectable antibiotics may need to be given. Topical medications, such as chlorhexidine rinses are applied to the skin as well. Most cases are resolved by this treatment but occasionally a "stubborn" case occurs. If this happens, your veterinarian will take another culture. Sometimes bacteria will change their spectrum of susceptible antibiotics as they are being treated. They can become resistant to the antibiotic being used.